Pastor Maldonado will join Romain Grosjean at Lotus in 2014. Maldonado replaces Kimi Raikkonen, who will drive for Ferrari next season, and has won his seat largely because the team need an injection of funds. A planned investment deal with the US-Middle Eastern consortium Quantum has so far failed to materialise. That meant Lotus could not sign their preferred driver, German Nico Hulkenberg, who has only limited personal backing. Maldonado comes with significant funds from the Venezuelan state oil company PDVSA, which has paid £30m a year for him to drive at Williams since 2011. "It is a fantastic opportunity for me," said Maldonado. "It's no secret that I have wanted a change of scene and the Lotus F1 team offered the very best opportunity for me to be competitive next season. "The regulations and cars will change significantly so it is a very good time for a fresh start." Lotus team principal Eric Boullier said: "It is clear that Pastor has pace and potential, demonstrated by his 2010 GP2 Series title success and strong races throughout his career at Williams. "We are convinced we will be able to provide the correct environment to enable him to flourish regularly." Lotus, who finished fourth in the constructors' championship, have made no secret of the fact they have had cashflow problems this season - Raikkonen quit the team two races before the end of the season because he had not been paid all year. The team owe him 17.15m euros (£14.5m) because of a salary of eight million euros and a bonus scheme worth 50,000 euros a point. Hulkenberg will now drive for Force India, where sources say his deal has been done. He is expected to be joined by Mexican former McLaren driver Sergio Perez, who is on the verge of concluding his own deal with Force India. Hulkenberg's Sauber seat will be taken by German Adrian Sutil, whose contract is also said by sources to be secured but has not yet been announced. The identity of the Swiss team's second driver is not yet known, but they are likely to stick with Mexican Esteban Gutierrez for a second season. This year's other Force India driver, Scot Paul Di Resta, will lose his place in F1 and is hoping to land a seat in US-based IndyCar racing. Lotus is a major step up for 28-year-old Maldonado, who won one race for Williams in Spain in 2012 but whose driving has often been erratic. 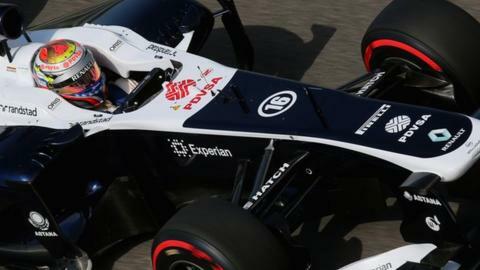 He has made it clear that he felt Williams had held him back this season, while the team were also happy to part company. Williams have signed ex-Ferrari driver Felipe Massa to join promising Finn Valtteri Bottas.